During a very dark time, a friend told me “Where there is life, there is hope.” I don’t know if he knew how profound those words were to me. In fact, I didn’t even know at the time. I just heard the words and applied them to my son’s situation. At face value, the statement is so simple. Just seven words strung together telling me that as long as my son is alive, there is hope that he will see the light — that he can give up his life of drugs. Then I began to think — what does this really mean to me; what is the real meaning to that statement? After a lot of deliberation, I was able to feel the true meaning of those simple words. Life is not just about our child with an addiction. 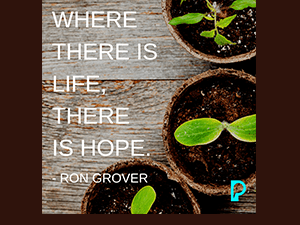 Where there is life, there is hope applies to the parent’s life, too. We can hope that our child will see the light and we can also hope for our own acceptance, peace and happiness. This statement applies to all of us and all of those we love. When I look around, I see life all around me. A wife, daughter, mother, father, brother, sister, caring relatives and friends are everywhere I turn. That’s when it dawned on me: Where there is life, there really is hope. Take some time to nourish yourself. It will not only be a gift for you, but for your loved ones, too. Consider looking at a drug user as desperately needing to feel good inside. If he is tired and can’t generate enthusiasm he craves stimulation. It’s a sign his stimulant neurotransmitters are deficient and he needs to be swallowing the amino acid L-tyrosine. If he is irritable and can’t sleep and is compulsive and has low self esteem he is missing the neurotransmitter serotonin and needs to be swallowing the amino acid L-tryptophan or the amino acid 5HTP produced by L-tryptophan. If he is anxious he needs to swallow GABA capsules to produce more GABA inside his nervous system. And if he cries easily, suffers from physical or emotional pain, and craves comfort he needs to swallow the amino acid DL-phenylalanine to maintain more of the neurotransmitter endorphin. Talk therapy no matter how great the therapist won’t replace missing neurotransmitters that triggered the need for using the drug of choice in the first place! Read The Mood Cure by Julia Ross or Seven Weeks to Sobriety by Joan Mathews Larson or End Your Addiction Now by Charles Gant, MD and you will have a true roadmap to recovery that is fast and lasts a lifetime. Recidivism is a sign the treatment wasn’t solving the core biochemical need of the person. It ISN’T an inevitable part of drug recovery! Look for a treatment program (there are a pitiful few of them) that understands the need for nutritional treatment to cure the cause of addiction. It took me some time and work, but during those tough times when I was able to be still, silence the worry and the thoughts swirling around and owning me and pay attention to my heart and my breadth … and the love I have for my son. Well that was when the worry and fear subsided and peacefulness replaced the chaos. And often with this peace came a calming clarity of what it was that I should do — what exactly my role was at that moment in time. Often my “do” was pretty simple. I found that when I lead with and met my son with love (not fear/worry) an opening comes and by golly 🙂 that’s when I would fill up my son with love, a hug, and positive encouragement.